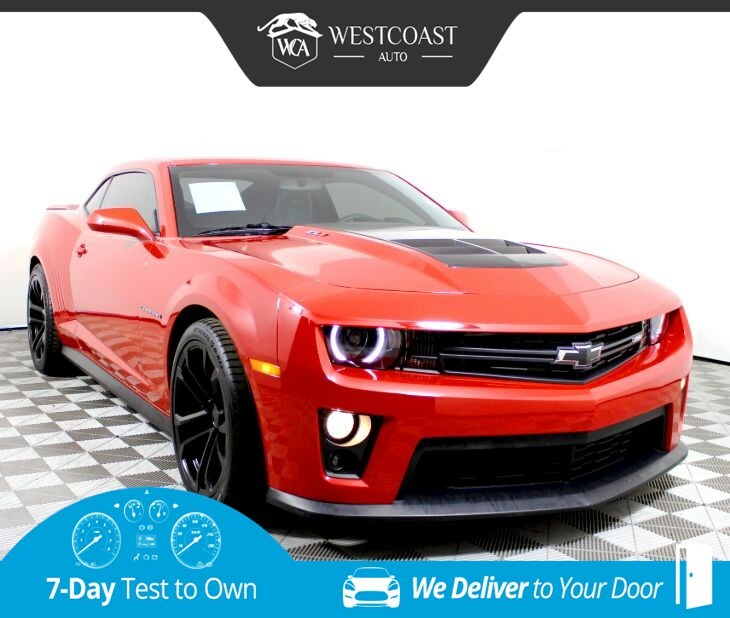 Our Clean CarFax 2013 Chevrolet Camaro ZL1 is presented in a dazzling Victory Red is of legendary makings! Our machine powered by a 6.2 Liter Super Charged V8 offering 580hp on demand paired with a Tremec 6 Speed Manual transmission. This offers unparalleled capability for track performance should you need to show a pesky Shelby a thing or two. In all road conditions, ZL1 Rear Drive coupe maintains its equilibrium, thanks to a performance-tuned suspension that uses Magnetic Ride Control to deliver exceptional responsiveness. Camaro ZL1 brings the thrill of the raceway to any road you are on. Take a look at our pictures and you'll find that our ZL1 Coupe is loaded with complete luxury such as nice wheels, adjustable front seats, and microfiber suede to grip you tight. Every inch of its interior is created to augment your ride with a Boston Acoustics premium nine-speaker stereo system, sunroof, USB port and a rear camera that displays in the touchscreen radio. True comfort inside and bold design outside.